Many across the world are still coming to terms with Donald Trump’s election as US President. But a man they probably know far less about, certainly outside the US, is the running mate who stood at Trump’s side. The name on the same ticket, only in a smaller font. That of Mike Pence. A man who may well herald something much worse. a Christian, a conservative and a Republican – in that order. But Pence’s notion of Christian charity apparently only extends to heterosexuals, women who don’t have abortions, and people who aren’t seeking shelter from war and conflict. Indeed, his voting history may give good reason for many to be nervous. Pence’s Christian fundamentalist views have resulted in a controversial voting history. On 6 March 2015, he signed the ‘Indiana Senate Bill 101’ into law. The legislation, approved on a vote of 40-10, sparked outrage. It essentially permitted discrimination against the LGBTQ+ community and other groups on account of religious belief. Resources should be directed toward those institutions which provide assistance to those seeking to change their sexual behaviour. Pence has opposed permitting LGBTQ+ people in the military to be open about their sexuality. He also challenged the repeal of the ‘Don’t Ask, Don’t Tell’ policy in 2010. Another controversy arose in March 2016 when Pence signed a bill placing new restrictions on abortion providers. This was ‘House Bill 1337’. It included a ruling that fetal abnormality should not be a legal justification for abortions. It also required fetal remains to be buried or cremated. Even openly ‘pro-life’ Republicans disapproved of the proposals. Days later, a US Federal Court stepped in, blocking the bill from taking effect. If Planned Parenthood wants to be involved in providing counseling services and HIV testing, they ought not be in the business of providing abortions. As long as they aspire to do that, I’ll be after them. The Lilly Ledbetter Fair Pay Act protects women and other groups from wage discrimination. It was one of the first pieces of legislation Barack Obama signed in 2009. It stipulates that victims of wage discrimination can sue their employers at any time during their employment. And up to 180 days after their last paycheck. Pence voted against it several times prior to its approval. He also opposed Obama’s transgender bathroom directive, which allows students to use bathrooms corresponding to their personal gender identity, not solely their gender as assigned at birth. The State’s conduct clearly constitutes national origin discrimination. A court injunction soon forced Pence to release the funds. It also ordered him to desist from interfering in the federal distribution of humanitarian aid to those fleeing conflict. Pence is also an advocate of state-controlled media. He reportedly planned to launch a state-run, taxpayer-funded news service for Indiana, called ‘JustIN’. Press secretaries would preapprove feature news and stories. The idea of stories prewritten for the media set off a wave of criticism from journalists around the country, who likened the Indiana endeavor to state-run media in Russia and China. The media has undeniably played an influential role in the shift of geopolitical attitudes in the West, particularly in recent years. News providers, even those in the mainstream which people rely on for impartiality and stringent fact-checking, have often received criticism for the demonstrable bias in their news reporting. And Pence’s enthusiasm to run his own ‘news service’ is a big cause for concern. The fact he wanted to exploit his political position to fund it with taxpayer money, even more so. Popular US comedy series like Veep tend to paint vice presidents as being largely insignificant. Powerless even. A figure of ridicule. In political drama House of Cards, Frank Underwood (Kevin Spacey) describes the post as being virtually a state of purgatory. Or a punishment. 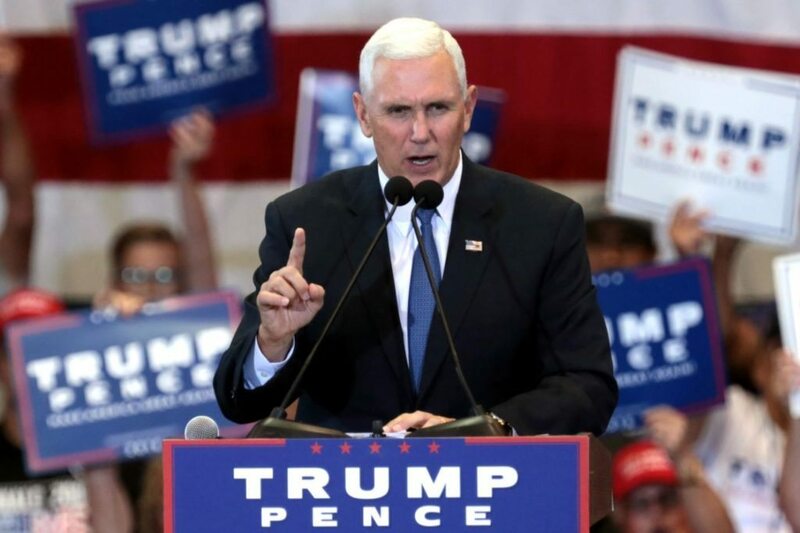 But if Trump fell ill or had to leave office (some analysts already predict an impeachment), Pence would be the next in line for President of the United States. At the same time, Trump is a man with no political experience. So it’s highly likely that he will need to rely on the more established political minds around him. In fact, The Financial Times has already implied [paywall] that Pence will be the guiding and ‘steady hand’ behind the Trump Presidency. And there are suggestions from Camp Trump that the Vice President could be “the most powerful” ever. The Republican plan all along? Many Republicans turned on Donald Trump prior to his campaign victory. And Pence is arguably far more representative of traditional Republican Party values. He’s tough on reproductive rights, on LGBTQ+ equality, and on gender equality. And he’s tough on refugees, the media, and science (he once called climate change a “myth“, and said “smoking doesn’t kill”). Just as Theresa May crept into power from the background when David Cameron threw in the towel in the UK, so could it easily come to pass in this Republican Presidency. Indeed, President-elect Trump seems more likely to be removed from office, or to throw a hissy fit and storm out, than perhaps any other president in US history. And US voters might just have let someone even more dangerous than Trump in through the back door.